Lamb's liver in an onion gravy topped with sweetcure bacon. 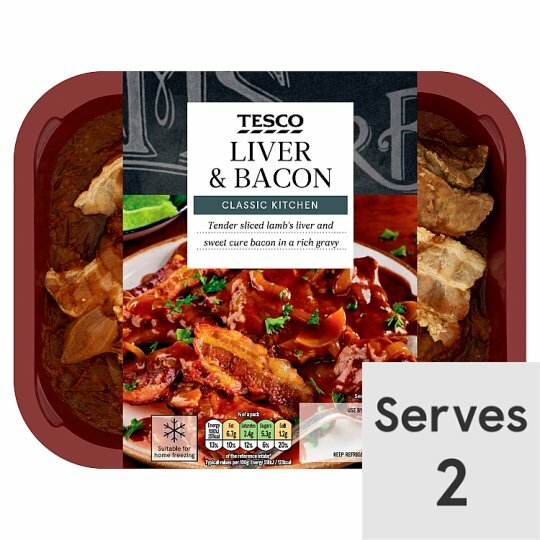 Lamb Liver (40%), Water, Onion, Wheat Flour (Wheat Flour, Calcium Carbonate, Iron, Niacin, Thiamin), Sweetcure Bacon (3.5%), Chicken Extract, Rapeseed Oil, Tomato Purée, Cornflour, Muscovado Sugar, Caramelised Sugar, Gelling Agent (Pectin), Salt, Vegetable Juices (Carrot, Mushroom, Onion), Black Mustard Seed, Sugar, Spirit Vinegar, Thyme, White Pepper. Sweetcure Bacon contains: Pork Belly, Water, Sugar, Invert Sugar Syrup, Salt, Honey, Antioxidant (Sodium Ascorbate), Preservative (Sodium Nitrite). Instructions: For best results oven heat. From Chilled: 190°C/ Fan 170°C/ Gas 5 25-30mins. Place on a baking tray in the centre of a pre-heated oven. Remove film lid for the last 5 minutes of heating to brown bacon. Leave to stand for 1 minute after heating. Stir before serving. Instructions: From Frozen: 190°C/Fan 170°C/Gas 5 40-45mins Place on a baking tray in the centre of a pre-heated oven. Remove film lid for the last 5 minutes of heating to brown bacon. Leave to stand for 1 minute after heating. Stir before serving. Instructions: From Chilled: 800W/ 900W 5½/ 5 mins.